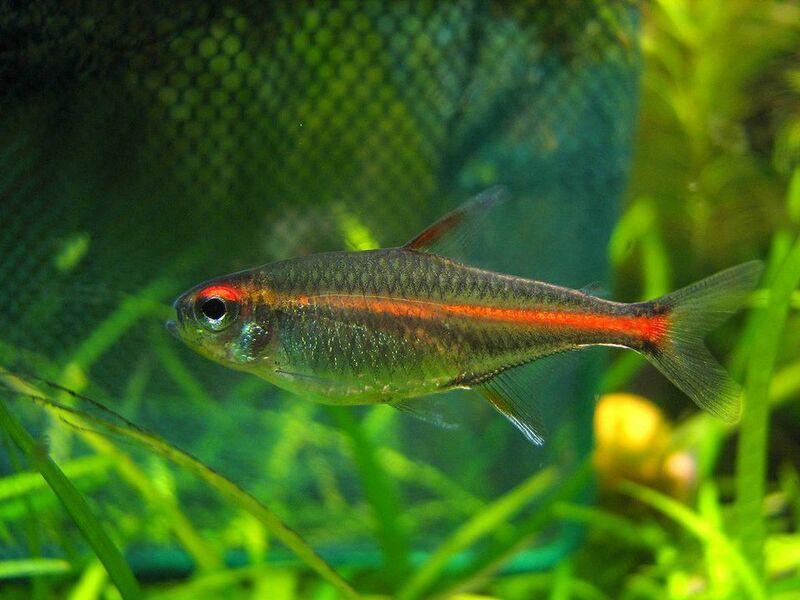 Once considered to be a difficult species to breed, The Glowlight Tetra or Fire Tetra, now presents no problem whatsoever to produce a large brood of healthy fry. Breeding can be very successful in even a small tank at a temperature of anywhere from 72F to 80F, with 75F being ideal. These fish prefer normal not too hard, slightly acidic water (the kind of water that is natural in the Florida Everglades, around which the farms where these fish come from are located). One interesting breeding method is to use a bare tank which should be thoroughly cleaned, and contain soft brown peaty water. In the bare tank place two or three nylon mops which have been sterilized by boiling (especially if you have used these mops in other breeding projects, they must be free of any biological residue). This method will get you in practice to breed Neon Tetras later on (as we have explained previously here). The easier way to breed the more forgiving Glowlight Tetra is to used well aged, natural chlorine-free water (for example, rain water from a rural area, or reverse osmosis water that has been left standing in the thoroughly clean tank with 3 or 4 bunches of fine leafed plants for about a week at a temperature of anywhere from 68F to 79F. Fully aerate the water for 4-6 hours before introducing the breeders, which should be conditioned separately for 7-10 days on live and frozen foods. One final note on water condition, using ½ existing aquarium water from the pairs home tank ad ½ well aged fresh water, with 3 bunches of fine-leaved plants works just as well as long as you are using a commercially bred pair of Glowlight Tetras. In reality, the pair are probably breading in your community aquarium frequently already if you keep your fish well fed and the water in good condition, but you will never see them and the eggs will be eaten as soon as laid. A large pair should be selected and conditioned until the female is literally bulging with row (eggs). They should be placed into the breeding tank carefully in the late afternoon. The next day, after some love play which takes the form of short darts at each other, the male and female come side by side, and lock fins. Then, trembling in close contact, they roll over in or against the plants or nylon mops. Eggs are laid and fertilized, many falling to the bottom of the tank. Fine-leaved plants are preferred, although the eggs are only slightly adhesive, so that a large number of the up to 300 eggs which can be laid fall to the bottom. Don’t worry, this should not cause the eggs to mildew, and the parents are not as quick to eat the eggs as many other Characin species. The fine-leaved plants are important, but it is more important to place the plant clumps well apart from each other to allow the fish to swim among them. Fertility may otherwise be low, because of the way in which these fish mate. They roll over and touch fins on each occasion, until up to 300 eggs are laid in batches of about 8-16 at a time. The plants or nylon mops allow them to brace themselves for the fertilization process as they chase through the tank. Even though most of these eggs will fall to the bottom they will be fertile. Naturally, remove the parents as soon as possible after noticing they have finished breeding activities, however the Glowlight Tetra is not the avid egg eaters that many other Characin species prove to be, as we previously mentioned so don’t panic, but do get them out when breeding activities have stopped. The fry hatch in about 24 hours, they hang on plants and the glass sides of the tank for another day or so. They become free swimming on the third day and should be fed infusoria and egg yolk the first 5-7 days followed by commercial powered growth food and baby brine shrimp. After two weeks, the young are easy to raise, and grow quickly! At about 3-4 months, if you have followed an aggressive and varied feeding program you may be ready to introduce your won school of brightly colored Glowlight Tetras into your Aquarium!